A few years ago a teacher colleague of mine conducted an informal survey in his classes. He asked his high school students to bring in images of men whom they thought were “beautiful.” After the boys got over the discomfort and awkwardness of the request, the results were quite interesting. The young ladies brought in picture of men like Orlando Bloom (in his Lord of the Rings attire) and Justine Timberlake (pre-wardrobe malfunction, mind you). The young men brought in pictures men like Brett Favre, Dwayne “The Rock” Johnson, and a scruffy, buff version of Brad Pitt from Troy. My colleague noted that the young men thought of the well-muscled men with good smiles and a five o’clock shadow as attractive while the young ladies brought in images of lithe, lean, “girly-men” who were not clean-shaven, rather they appeared to have no need to shave as of yet. When asked about the difference, one young girl commented about the images the young men had brought in saying, “He looks like he would hurt me.” The young ladies, as a whole, rejected masculine men out of intimidation and fear. Why would this be? Probably it is because they have seen so many examples of men behaving badly. Our society is full of them. Television is saturated with them. Even the Church has more than their fair share of men who do more harm than good. We have, regrettably, quite a few bad role models. That is where Saint Joseph comes in. Saint Joseph is the best role model for men in church since Jesus Himself. The first time we hear of St. Joseph, we hear that he was “a just man.” (St. Matthew 1:19) Inasmuch as it was possible to be so under the Law, St. Joseph was a righteous man. We can see this righteousness in five areas of St. Joseph’s life: his efforts to follow the Law of the LORD, his care for the widows and the orphans, his obedience, his rearing of his sons, and his work ethic. Thoroughly counter-cultural for today’s society, St. Joseph’s character can be seen in his obedience. Today, we make a virtue of independence, which is often code for rebellion. It seems as though one of the most humiliating events that a modern man can endure is being publicly made to submit to and obey an instruction of which he clearly disapproves. That humiliation is made even worse if the bidder chooses not to explain himself and simply says, “Do what I say.” Yet, biblically speaking obedience is a virtue. The eleventh chapter of the Epistle to the Hebrews is full of examples of heroes of the faith who obeyed, beginning with Abraham. The children of Israel would be exalted because of the obedience to the LORD. In the Book of Judges, the people brought trouble on themselves because they “did what was right in their own sight” rather than obeying the Word of the LORD. The Prophet Samuel declared, “Behold, to obey is better than sacrifice, and to heed than the fat of Rams.” (I Samuel 15:22) St. Joseph was obedient. When he received angelic messages, he may have questioned and he may have had his doubts, but he did obey. He did what he was told when he named the child Jesus. He did what he was told when the angel of the LORD commanded him to “Arise, take the young Child and His mother, flee to Egypt.” (St. Matthew 2:13) He did what he was told when, years later, the angel commanded, “Arise, take the young Child and His mother, and go to the land of Israel.” (St. Matthew 2:20) This is an incredible amount of trouble and hassle for St. Joseph. He could have thought he knew better. He could have dismissed the angel as a bad dream or indigestion. He could have done as he would have liked, not fled Judea, and the results would have been unthinkable. He could have stayed in Egypt. Imagine the saint “finally getting the boxes unpacked” before receiving this angelic message. Consider the incredible burden of migrating across the desert, not once, but twice. 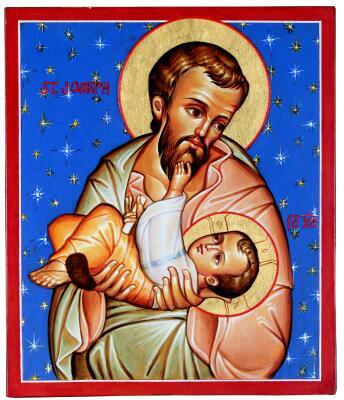 Again, St. Joseph could have stayed in Egypt, and, again, the results would have been unthinkable. In Jewish culture of the day, it was the fathers who taught their sons of the LORD. The young boys went to the synagogues with their fathers. They went into the courts of the Temple with their fathers because the women could not go in past the Court of the Women. Fathers are often judged based on their children. It might be tempting to dismiss St. Joseph’s impact on Jesus’ life by saying “Jesus was the Son of God! How much work could Joseph have had to do?” But saying that neglects the fact that St. Joseph had another son of Biblical not. St. James the Just was the son of Joseph as well, this time without the divine nature and will. Nevertheless, what St. James learned of the LORD would have first come to him through the teaching of his father St. Joseph. Jesus would have instructed James, as would the Holy Spirit, but there was a foundation that had been laid years earlier to prepare James to receive Jesus as the Messiah. That foundation must have come from St. Joseph. 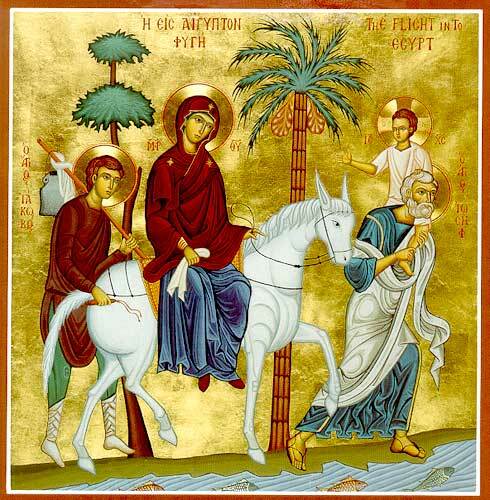 The verses of Holy Scripture quoted by Our Lord and St. James, the prophecies about the coming Messiah, their love of the LORD came to them sitting on the knee of their father, worshipping the LORD with him and hearing the stories of the Patriarchs from him at bed-time. The father’s job of preparing his son can not be overstated and Saint Joseph reared at least two saintly sons. Finally, Saint Joseph worked to provide for his family. Jesus was not born to a king or nobleman. He was not the son of a priest or prophet. He was not born into a life of leisure. St. Joseph was a carpenter, a man who worked with his hands his whole life. When St. Joseph led the Holy Family to Jerusalem to observe the Jewish rituals of purification and present Jesus in the Temple, he offered two turtledoves or two young pigeons. (St. Luke 2:22-24) What should be recalled is that the birds were the paupers’ offering. It was an allowance made for those who could not afford to bring a lamb. St. Joseph worked and was not always wealthy or successful by his world’s standards. 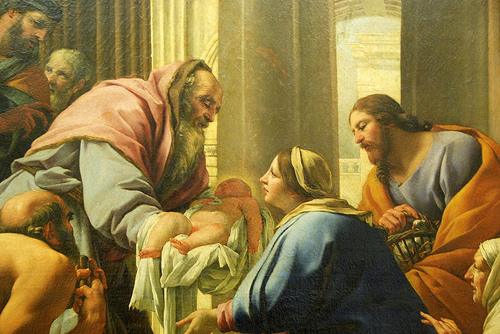 Nevertheless, St. Joseph worked to provide for his family. Saint Joseph is a model of manhood and a corrective for today’s society. His steadfast desire to seek the LORD first and his care for those who had none to care for them stand in contrast with the “Me First” attitude of the world. His obedience in the face of great adversity is a direct rejection of the rebelliousness of this day and age. His love and care for his sons and his dedication to work and provide for his family is a stark contrast to this day’s “love them and leave them” and let the government take care of them attitude. In short, St. Joseph is a role model for all men. That should only make sense to us because, of course, for the first years of His life, St. Joseph was Jesus’ role-model. O Saint Joseph teach me(us) how to work better. If there are gaps in my(our) professional formation that need be filled, please hastily obtain for me(us) such help that I(we) may become competent and work hard to foster the kingdom of God on earth. Amen. Provide for us O St. Joseph all other things that I(we) might need, especially those that I(we) am not aware of. You are such a good father. May you always be honored universally! Amen.